Shakespeare said it best “There's rosemary, that's for remembrance, pray, love, remember”. Traditionally Rosemary is used to assist with improving the memory and is favoured by people who are studying or need to focus. Note: Actual study will be required, this soap is awesome but it can't do it all on its own. 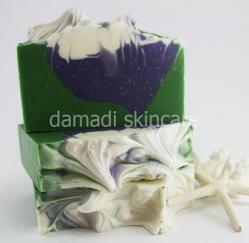 * Note from Angie - I now make this soap with swirls through it, rather than big blocks of colour. Its much prettier than the origanal style.